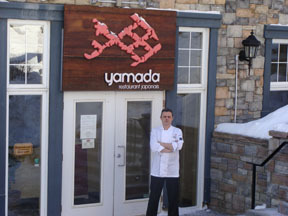 Restaurant Yamada at Le Westin Resort & Spa Tremblant in Mont-Tremblant, Canada Pedestrian Village located in the focuses on Japanese cuisine in an attractive contemporary setting, featuring Chef Philippe Lavaud in the kitchen, and Sushi Chefs, Rio San, Eric, and Frederic demonstrating their skills and showmanship at the sushi bar. 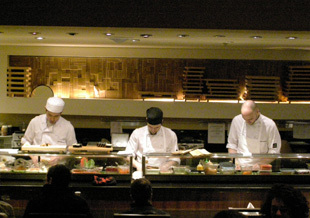 The attractive restaurant features contemporary décor with long, floral print cylindrical lighting, black wood tables accessorized with pyramid lights flanked by black velvet chairs wearing faux exotic animal furs covers, a wall of windows overlooking the Pedestrian Village, and a sushi bar where guests can sit and watch the sushi chefs, Rio San, Eric, and Frederic in action. 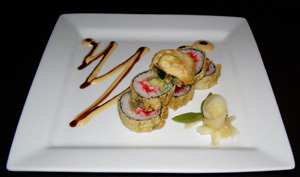 Edward and I had a delectable dinner at Restaurant Yamada in late February 2011 where we enjoyed discovering their maki, sushi, and tempura presentations. The restaurant is on two-levels and our table on the second level overlooked the sushi bar where we had the opportunity to watch the chefs create the orders. Restaurant Yamada offers a full menu with traditional soups, salads, and enticing main courses including Tori kushiyaki (brochette of chicken and vegetables with yaki sauce); Kamo Pekin kushiyaki (Brochette of Peking duck with yaki and cassis sauce); Filet mignon Ishi tama (Slices of filet mignon cooked on a stone spiced with pirikara sauce) and Ebi yaki (Grilled shrimp nestled on a bed of fried rice flavored with “sauce américaine” ) to name but a few, as well as offering a Nigirisushi, Sashimi, and Makisushi menu. 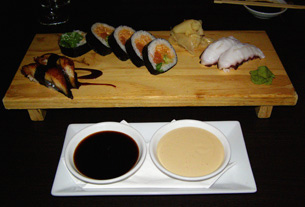 After a day of downhill skiing in the morning, followed by cross-country skiing in the late afternoon, we wanted to enjoy a lighter meal, and decided to forego the main courses, and instead order from their Nigirisushi, Sashimi, and Makisushi menu. One of the more unusual, but certainly very tasty maki items listed on the menu that we ordered was the maki B-52, made with salmon, Rice Krispies, avocado, and lettuce served with a spicy sauce artistically presented on a wooden tray along with our sushi selections of two pieces of Unagi, which was smoked fresh water eel, and two pieces of Tako, which was octopus. 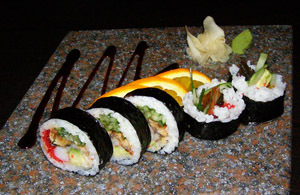 Although we had never had maki made with breakfast cereal as one of the ingredients before, we loved how the cereal added texture to the maki roll imparting a unique flavor combination. Japanese cuisine pairs exceptionally well with champagne or sparkling wine, and we paired our selections with a bottle of Moët and Chandon Brut Impériale champagne, which had persistent bubbles, a delicate rich fullness and slight fruitiness. We continued with the Warm Maki, Yamada Chop, made with tuna, shrimp, and avocado tempura, presented as six maki rolls served with a pickled ginger “flower” and wasabi “leaves” accompanied with ginger sauce and caviar. What we especially enjoyed about the Yamada Chop was the interesting tempura coating on the nori, which added extra flavor, texture, and crunch. 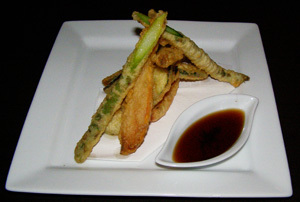 We rounded out our dinner with the Vegetable Tempura that arrived on a square white plate as a tall, stacked tower made with delicately crispy sliced sweet potatoes, asparagus, snow peas, and zucchini that were quickly deep-fried. Excellent food, professional attentive service, and a “show” with dinner, made for a very pleasant dining experience at Restaurant Yamada. Read more on Le Westin Resort & Spa Tremblant in the Hotels and Resorts, Spas, and Chefs' Recipes sections where Chef Philippe Lavaud shares a delectable taste of the Restaurant Yamada.